If camping for you is more about an enjoyable weekend away from the big city than an extreme survival situation, there’s no shame in making the trip more comfortable and more convenient. 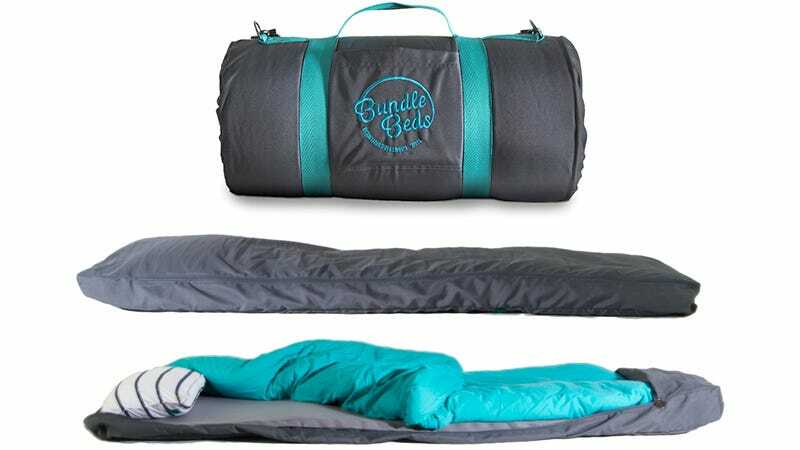 And the Bundle Beds sleeping bags promise to give you a better night’s sleep—with less stuff to pack. When rolled up the Bundle Beds are about the size of a small duffel bag, so if there’s an hours-long hike to your campsite, you might want to consider a lighter and more compact sleeping bag. But if you’ve got a car trunk’s worth of space for packing camping supplies, the Bundle Beds might be a more appealing option since they unroll with everything you need for a comfortable night’s sleep. The base layer is a self-inflating mattress, about two inches thick, that will easily cushion any forgotten twigs or stones underneath a tent. On top of that is a soft jersey cotton fitted sheet, a synthetic down pillow, and a hydrophobic duvet to keep you warm. Getting your bed ready is as easy as unrolling it, and it’s just as easy to bundle and roll back up in the morning. The Bundle Beds also function as a very compact portable bed for those times when you have unexpected guests who don’t necessarily want to squeeze onto a tiny couch. That added value might help sell you on the idea of a $260 Kickstarted sleeping bag that isn’t engineered to withstand arctic temperatures. It’s all about comfort and convenience which is enough of a sell for most outdoor enthusiasts—or anyone who still refuses to make their bed in the morning.